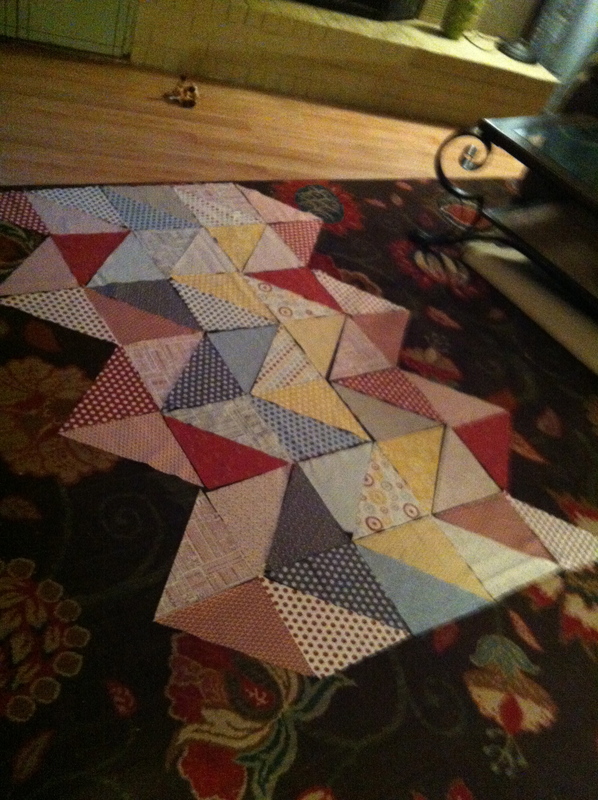 Back in May 2012 my Friend Jenny texted me about joining THIS quilt along. I honestly had no idea what a quilt along even was. But I was somehow instantly intrigued. I asked a few questions and looked at a few fabric options. After falling in love with several fabric choices, I found myself texting back “I’m in!”. I then recruited another friend, Meagan to join us. 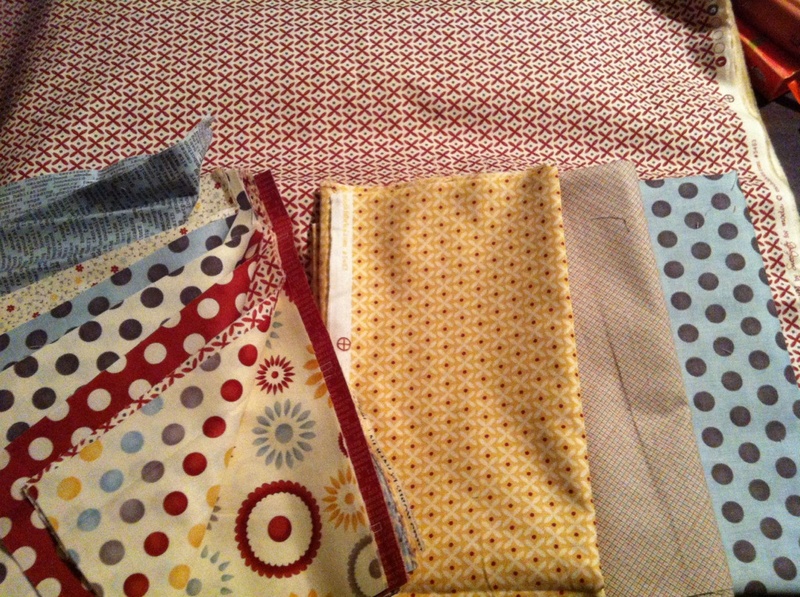 That week I purchased all of the fabric. And began following along. Ashley from Mommy by day Crafter by night had such a great tutorial and links to many other helpful sites. I chose the Hometown by Sweetwater for Moda collection. I was in love. 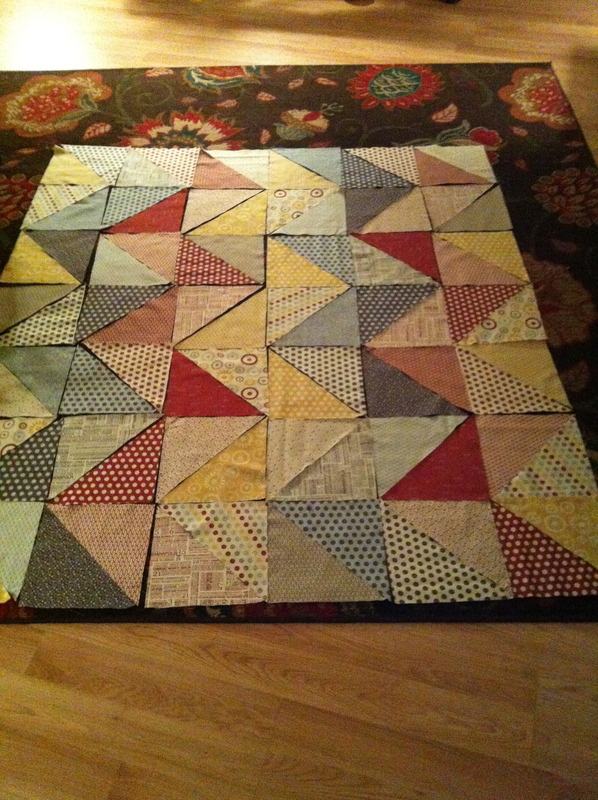 Next came all of the cutting, then the piecing. 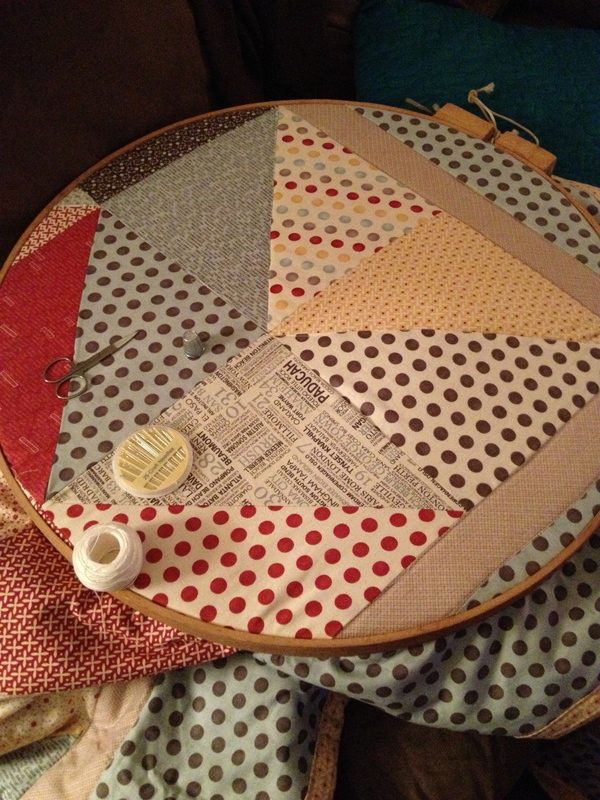 After I had the design layout all figured out, I began to sew the triangles together. 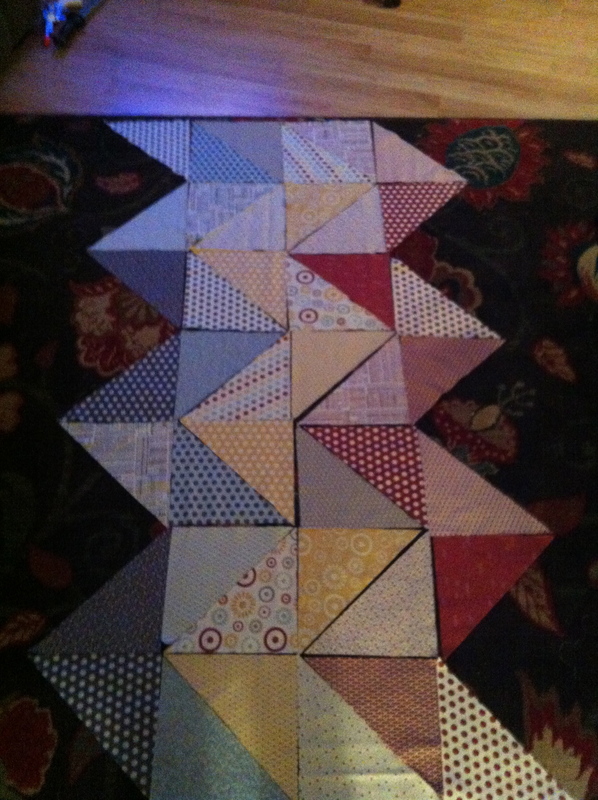 Once the triangles were sewn to form squares, I lost steam. And life got really busy. I hated to set it aside, but it just kind of happened. If you read my last post, you know that I have a little history of letting hobbies fade. I did not want that to happen this time… so fast forward to FEBRUARY 2013. Yes, about 8 months after I started this project…. 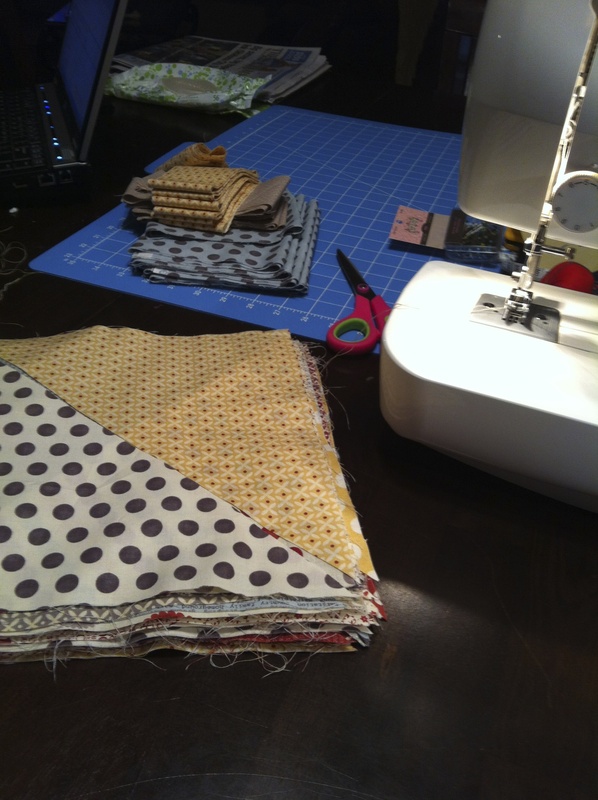 I had an opportunity to get away for a weekend and sew (and eat) as much as possible for two and a half days, with two of my closest friends. 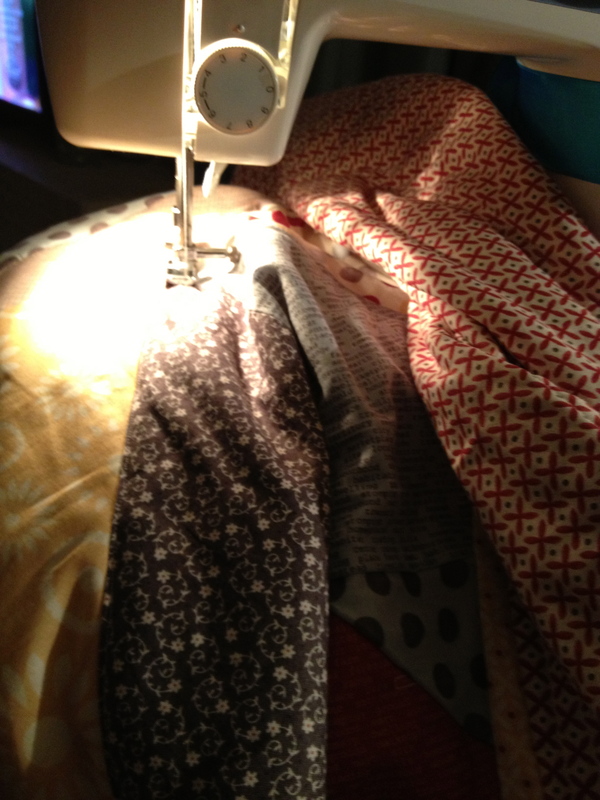 My friend Jenny just happens to be a talented seamstress and was with me to hold my hand and push me along. 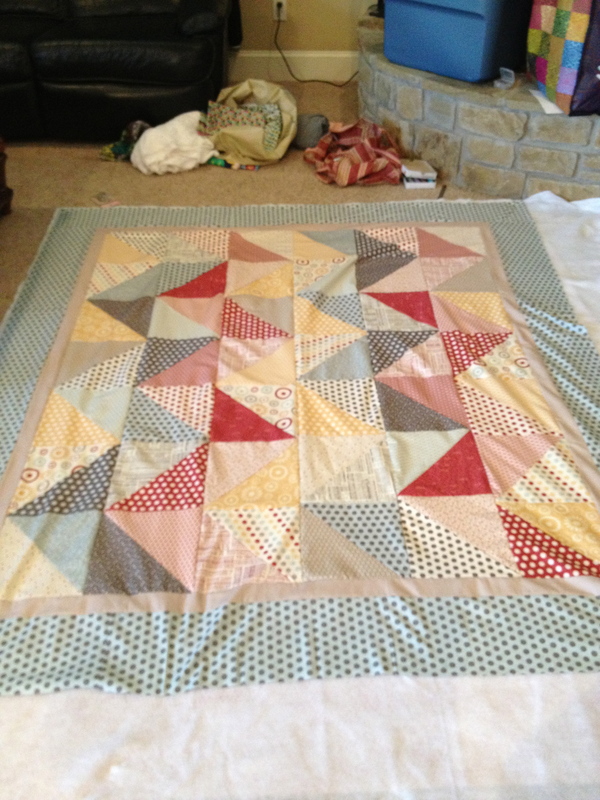 I’m so happy to report that I was able to finish the quilt top, baste and bind the quilt! Yes, all in one weekend. It’s amazing what can be accomplished when you are uninterrupted! 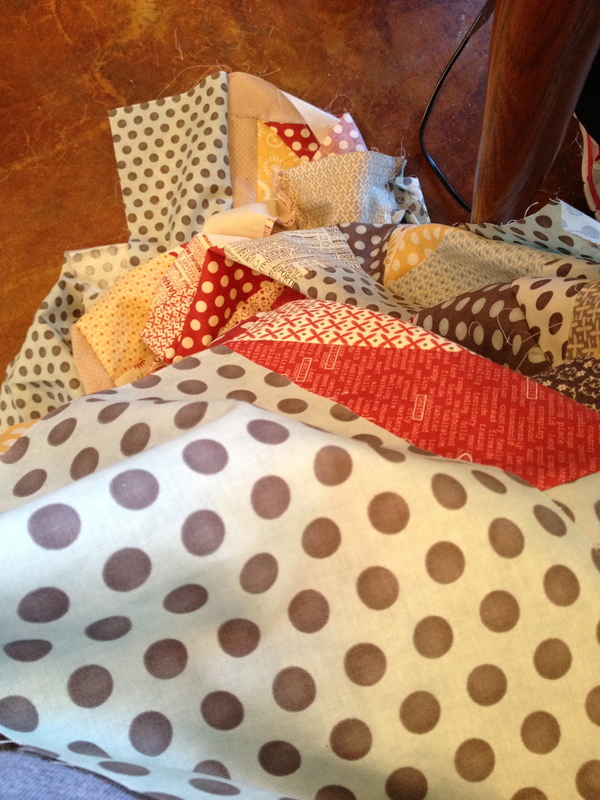 Because of some issues with my machine, I decided quilt by hand…. once back at home. I quickly realized that I didn’t really want to do that for my first project. So, I fought my machine a little more and won! 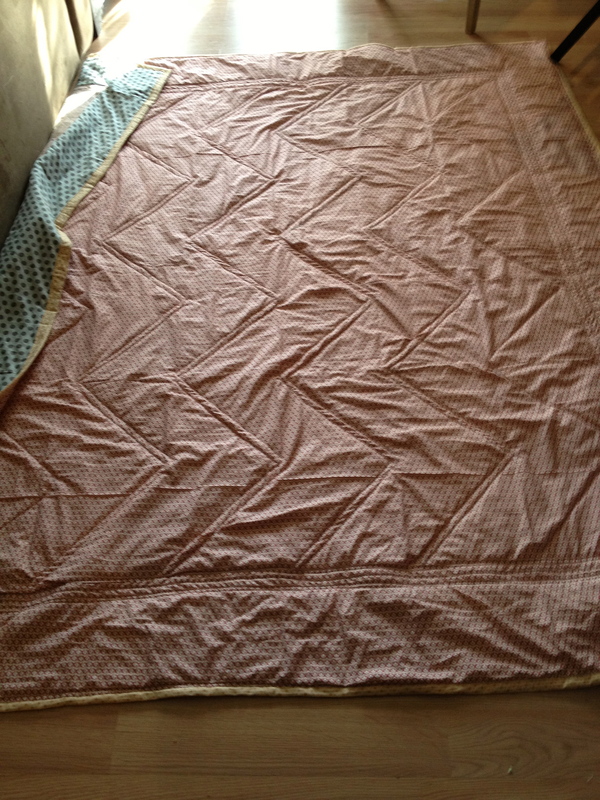 I did the machine quilting a little backwards, but it turned out great! Here is the finished product before being washed. 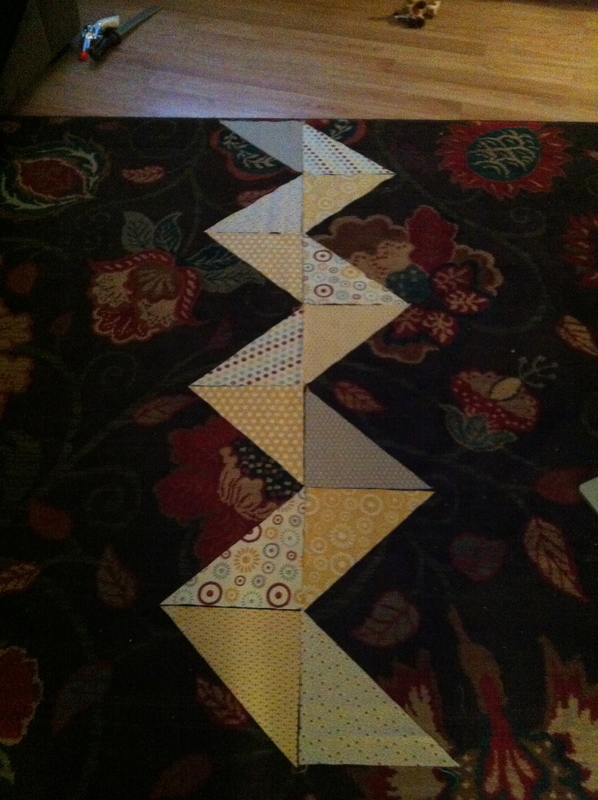 My Zig Zag quilt is far from perfect, but I absolutely adore it. I am so proud of myself for tackling this project, but even more proud that I actually finished! 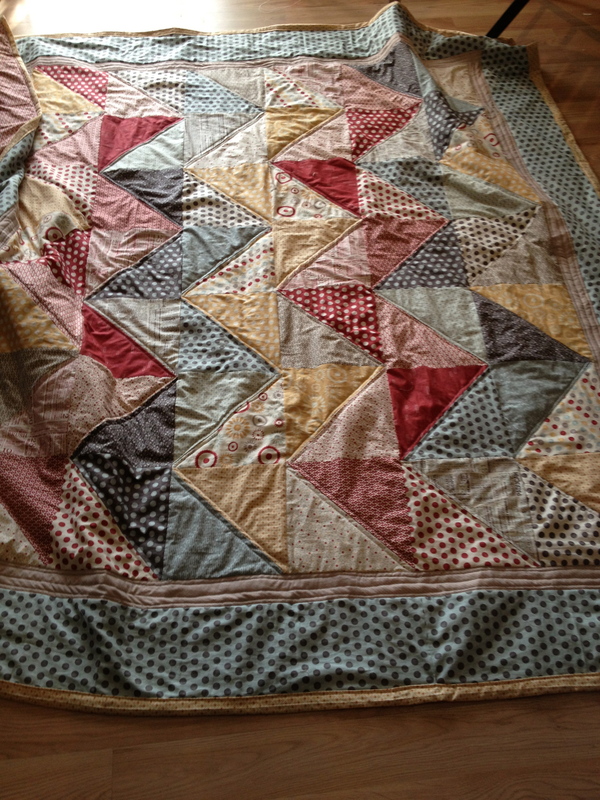 My first quilt is one that I will keep forever. 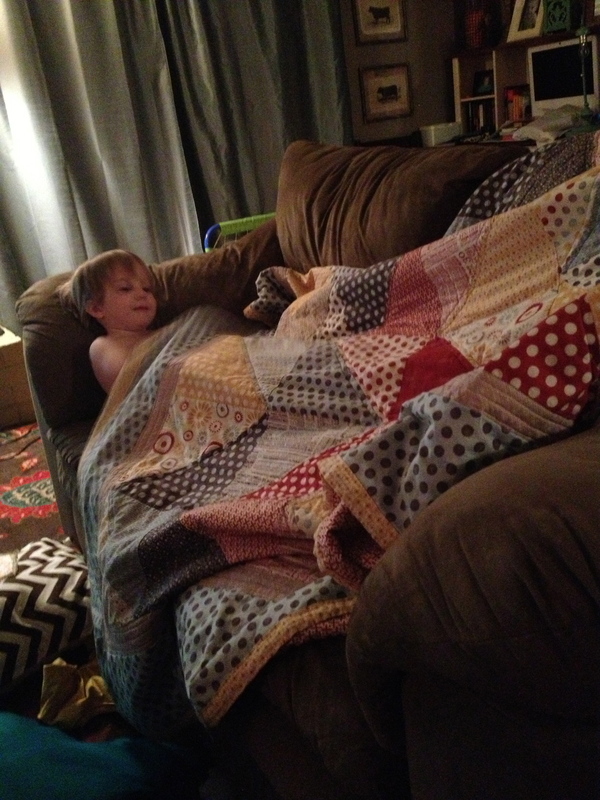 Much thanks to Ashley @ Mommy by day Crafter by night for the awesome quilt along and tutorial! This turned out so great! So glad you joined in on the quilt along!! This looks great and I love all the polka dots! I just started cutting fabric last night for my first quilt along – a Modern Trees quilt for Christmas with Christa’s Quilts. I love, love, love it! That’s a challenging first quilt. And I only saw you cry once while making it. 🙂 Here’s to future quilting/crafting/eating weekends!!! !